Let Them Eat Sugar Sculpture! The Getty Celebrates Edible Table Art : The Salt The party animals of Europe made festive, elaborate centerpieces from food from medieval times through the 18th century. 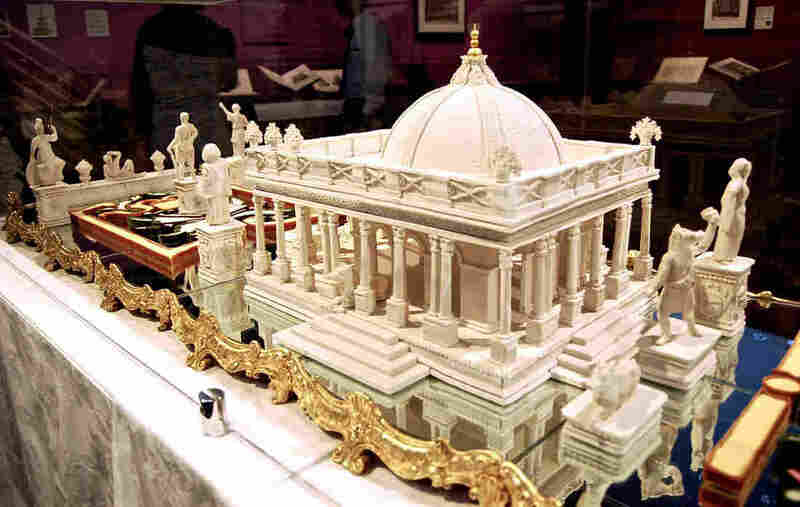 Among the most notable of their table art traditions is the sugar monument. One of the main attractions in "The Edible Monument" exhibition at the Getty Center in Los Angeles is a nine-foot long sugar palace showing the Greek sorceress Circe meeting Odysseus' men. Enter a Getty Center gallery in Los Angeles, and you'll be greeted by a nine-foot long sculpture of the Greek sorceress Circe transforming Odysseus's men into swine. 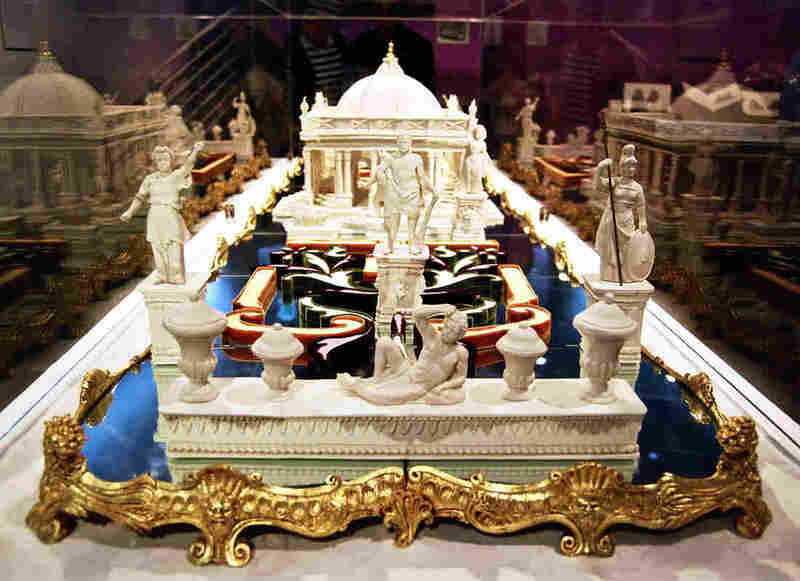 What's most remarkable about this piece is that every inch of it – from the ornamental balustrade to the fine pink, yellow and white sands in the miniature garden — is made of sugar. The sugar palace might have been the centerpiece of an 18th century French wedding table. Today, it's part of a Getty exhibit called "The Edible Monument: The Art of Food for Festivals" that runs until Mar. 16. At the end of the party, guests were often invited to break off pieces of sugar sculpture to eat or take home as souvenirs. "These very elaborate centerpieces in the middle of tables were made for people to admire while they ate and then the food would be served around them," says the exhibition's curator Marcia Reed. What "The Edible Monument" shows us is that our love of party decorations goes way, way back, says Reed. Besides this sugar art, the show features extravagant serving vessels and scenes, such as silver tureens with sculpted rabbits and heads of cauliflower, colorful scrolls depicting 16th century ox roasts and prints portraying triumphal arches made of bread, cheese and suckling pigs. Sugar and pastry were two of the foods that moved out of the kitchen and into the artist studio during the Renaissance. The period's finest kitchens employed chefs and confectioners who knew how to handle sugar paste and turn it into sculpture. White sugar was prized by Europe's elite because it was pure, beautiful and exotic, having been imported from Africa and the Caribbean. "Sugar is a great way of showing how skillful these past practitioners were because it is one of the few foodstuffs you can show in a museum without it decaying," says British culinary historian Ivan Day, who created the Circe sugar temple on display at the Getty with artist Tony Barton using sugar paste, molds and a 1749 French engraving. Day's latest sculpture should last a while; he says similar sculptures he made 30 years ago remain in good shape today. It helps that when sugar is combined with gum and water, it becomes an extremely pliable paste that has the consistency of Play-Doh, according to Reed. She says the sugar paste used in the Renaissance period is comparable to wedding cake fondant we see today. When it hardens, this sugar paste has the color and substance of Necco Wafers. Medieval sugar statues were the inspiration behind the sphinx artist Kara Walker installed in Brooklyn's Domino Sugar factory in 2014. "I was reading this book, Sweetness and Power [by anthropologist Sidney Mintz], and I came across these sugar sculptures called subtleties that they had at medieval banquets," Walker told the Guardian. "Up until that point, I had been thinking of finger-wagging doom-laden things about the history of slavery and sugar and America. It didn't take into account what people wanted to look at." Day says sugar monuments may be stunning to behold but also have a dark history worth remembering. "When these extraordinary self-indulgent masterpieces of edible art were being produced for European palaces ... poor human beings who harvested the raw material lived dreadful and tragic enslaved lives," he says. Selected works from "The Edible Monument" exhibition can be viewed online. And several special events are still to come. In January, Day will discuss the evolution of edible table art at the Getty and teach museum visitors how to make their own Twelfth Cakes and tazze from sugar paste and 18th century molds. Then in February, art historian Joseph Imorde will discuss how the popularity of refined sugar led to an increase in tooth decay in Renaissance Europe. Sugar at that time was thought to have health benefits and was often taken as a digestive. Other food exhibits at the Getty include the "Salad Garden," where artists are making salads from heirloom vegetables and "Eat, Drink and Be Merry," a room of rare manuscripts from the Middle Ages and the first known portrayal of a pretzel.